An op-amp is usually used as a comparator in cases where its speed and accuracy are not critical. As illustrated in the earlier post (OP-AMP COMPARATOR), the switching speed of the op-amp comparator can be improved and noise can also be eliminated. 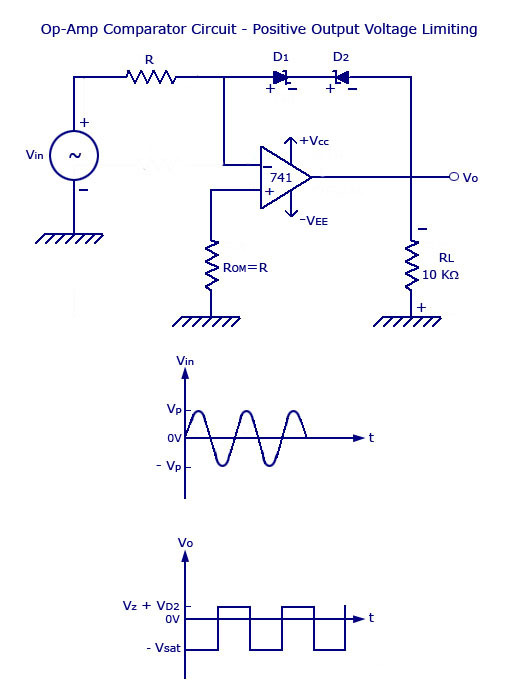 The offset problems can also be reduced by adding a voltage compensating network and a offset reducing resistor. Since the op-amp is originally designed to act as an amplifier, its output will not act linearly with logic families like TTL. A TTL requires input voltages which range between (0-5) volts. Thus, to keep the op-amp’s output voltage swing between these ranges, other components like zener diodes are added onto the circuit. 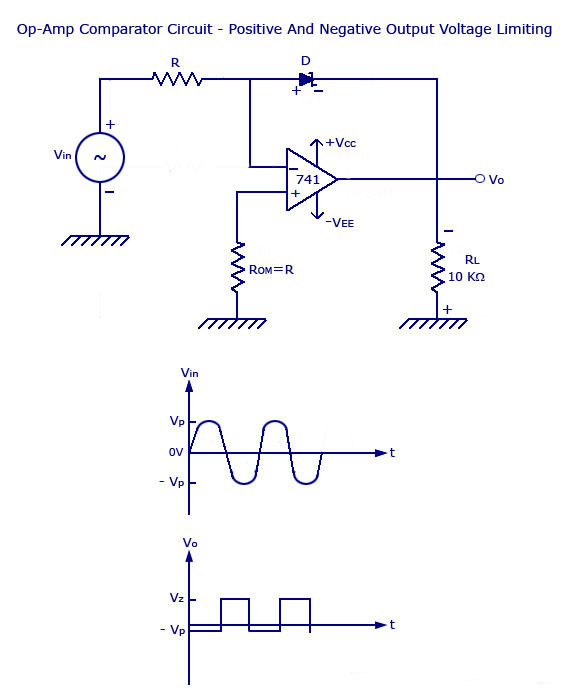 Such circuits with specified output swing are called voltage limiters. Some of the most commonly used voltage limiter circuits are shown below. In the figure shown below, there are two zener diodes that are connected in the feedback path of the op-amp circuit. This design helps in keeping the voltage limit between the positive and negative values of the output voltage, V 0 . As shown in the waveform, as the voltage Vin increases from 0 to positive voltage, the value of V0 increases in the opposite direction (negative). This goes on until the diode D1 becomes forward biased and D2 goes into avalanche breakdown. If Vo increases from 0 to negative voltage, Vo increases positively until diode D2 is forward biased and D1 goes into avalanche condition. Thus the limit of output voltage swing is between +(V Z + 0.7) and –(V Z + 0.7). In the figure, ROM is used to reduce the offset problems. Vin will appear across resistor R, since the v 1 =v 2 =0V (virtual ground). The figure below shows a combination of zener diode and rectifier diodes. This circuit is used to bring the level of swing of V0 to a positive direction. When V in ranges from 0 to positive voltage, D2 is reverse biased and thus V0 = -V sat . When V in ranges from 0 to negative voltage, D2 is forward biased and D1 goes into avalanche condition. Thus V0 = V Z + V D2 . 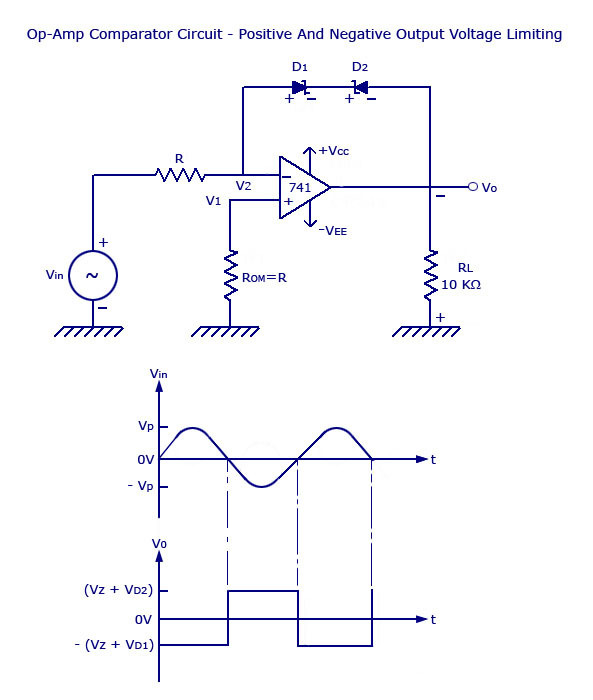 The figure below shows the use of a single zener diode in the feedback path of an op-amp. This enables the output to be limited between +VZ and –VD. V – Voltage drop across the forward biased zener.